My kids and I are just a little bit excited that Hotel Transylvania is available on DVD and Blu-ray today (shh…don’t tell, but someone who’s having a birthday tomorrow is getting this!). 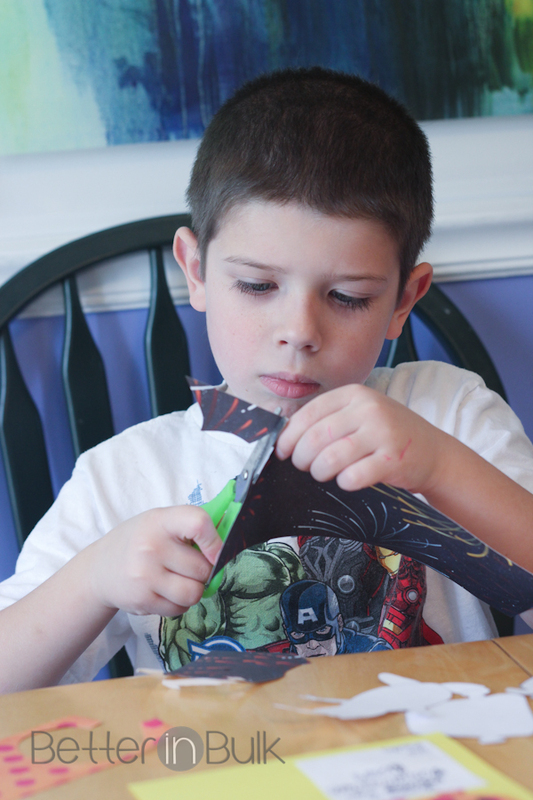 To celebrate the release of the DVD, my kids and I came up with a super-fun and easy craft inspired by the movie. And what better craft is there at this time of year than handmade Valentine’s cards?? Not only was the timing perfect for us to make DIY Valentines, but this coming weekend is the perfect time for the rest of you (hint: this project will keep the kids entertained for a good long time while YOU watch the Super Bowl this weekend). 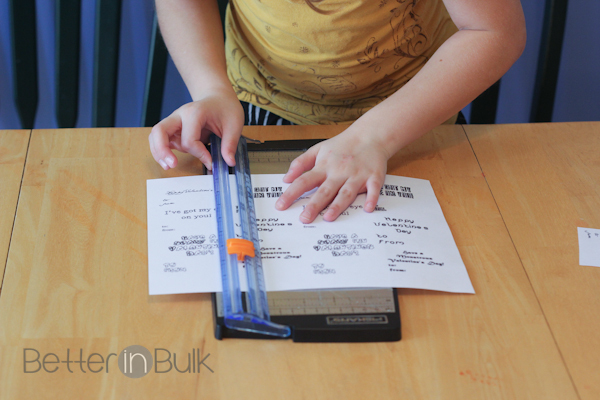 Print Monster templates on card stock and cut them out carefully. 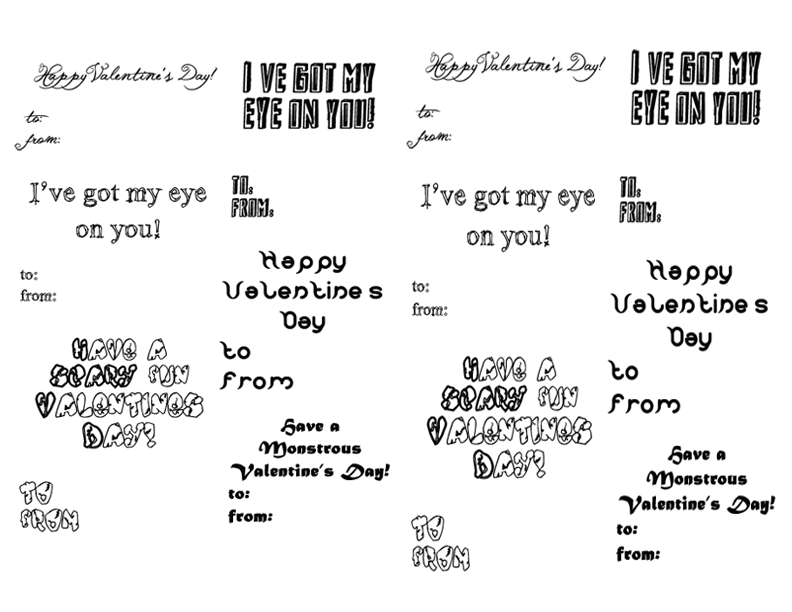 Print Valentine’s Day sayings on plain white paper and cut them out. Trace monster templates onto the BACK (non-patterned) side of your patterned/scrapbook paper. Cut various-sized cards from plain colored card stock. 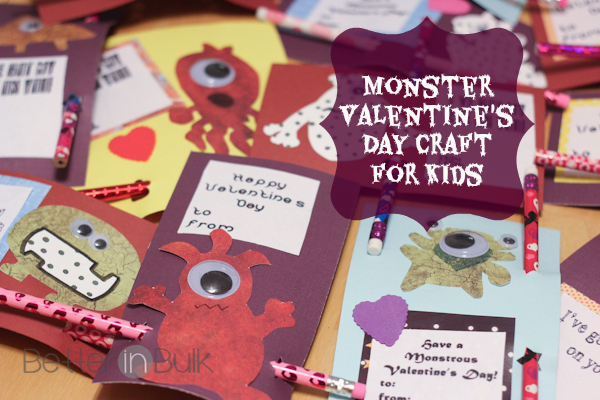 Glue your monsters, Valentine’s Day sayings and messages, and any other special touches onto the cards stock. Don’t forget to add some googley eyes (FYI – the eyes are easier to attach using Elmer’s school glue rather than glue sticks). Make them your own! And don’t forget to have your kids address each card to their friends. Punch two holes to pass the pencils through. If you’re using a traditional hole punch, you may need to punch twice in the same spot to make the opening large enough for the pencils. Attach pencils and admire your handmade Valentines! 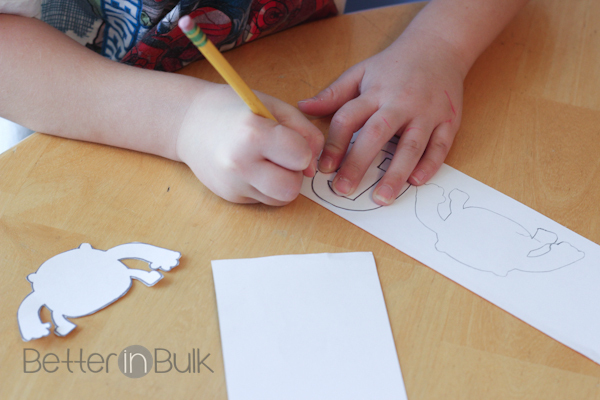 How to adapt for younger kids: Since cutting can be tricky for younger kids, you can easily adapt this by simply letting your kids color each monster before cutting them out. Just eliminate the template-tracing step. 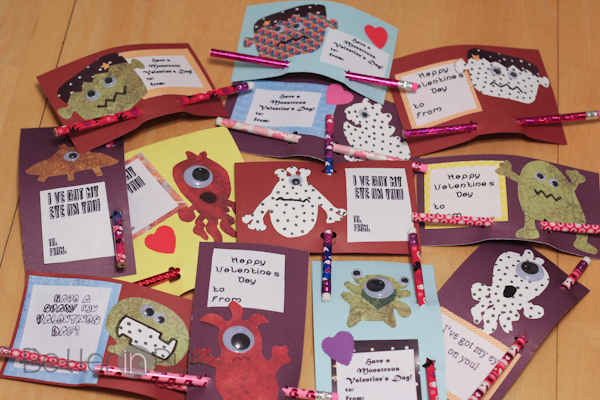 An adult can help cut out sayings and finished monsters and the kids can glue and decorate the cards however they chose. Have your kids seen Hotel Transylvania yet? This weekend would be the perfect time to pick up the movie for the kids (they can make some Valentines cards and watch the movie in another room while you watch the Super Bowl. You won’t hear a peep from them for hours!). MONSTER PARTY APP: The Hotel Transylvania Monster Party app for your iPad, iPad Mini and iPhone lets you create your own monster, play a memory match game, and explore the hotel. GOLDRUN MOBILE APP: With this virtual photobooth app, you can take a photo with your favorite characters from Hotel Transylvania. Share your photo on Facebook, Twitter and more. Available for both iOS and Android devices. MONSTERIZE YOURSELF ON FACEBOOK: The Facebook app Monsterize Me allows you to alter your picture with monster-inspired teeth, eyes and more. Upload a photo or choose one from Facebook. Add Hotel Transylvania characters alongside yourself, as well as “monsterizing” your picture with hats, eyes teeth and more. Save it to your computer, print it, or share it on Facebook. Note: This is a sponsored post, but all thoughts and craft ideas are my own. I found some adorable Monster templates at SeeCateCreate.com and linked to her post here, but you can always draw your own! Hope you enjoy! « The One and Only Ivan – Announcing the 2013 Newbery Medal Winner! What a great Valentine’s Day project for the kids. Would love if you shared this on the Merry Monday link party and the Spring Craft Blog Hop. How adorable! Thanks for posting! Perfect timing for me to find this post!